Wedding planning is not all that hunky dory for you after all? You’ve been stressing over every little detail so much that you’ve begun stress eating? Hold that next morsel right there and stop with the worry - everything is going to be just fine. We understand brides can give into temptation very easy. Be it those cheese loaded pizzas or overly-indulgent rich chocolate desserts. Days preceding your wedding your mind automatically starts blocking these temptations with the fear of not fitting into those pretty lehengas you choose for your pre-wedding celebration and D-Day. 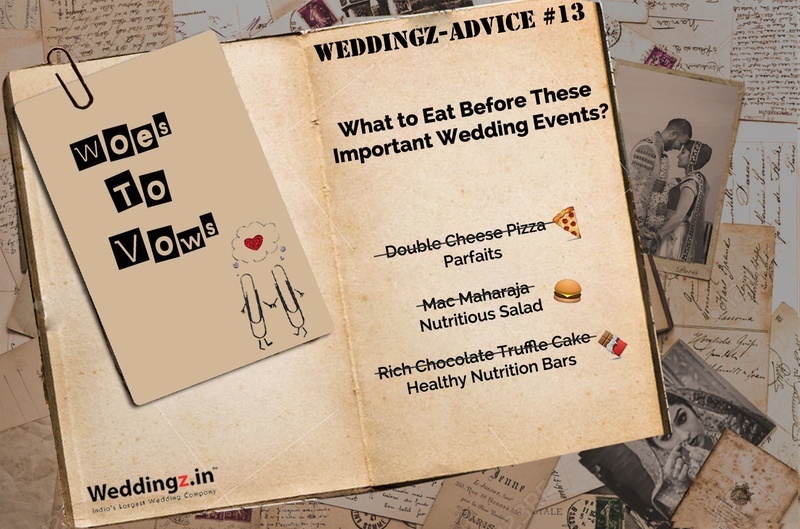 To help you stop binging on junk and curb those late-nigh craving, maintain your weight, stay bloat free, gain healthy and glowing skin, we give you some quick and simple tips on what you should eat before these important wedding events.